The charter. Photo by Nicolas Andrade. The Galápagos Islands situated well off the coast of mainland Ecuador would have to be among one of the most undiscovered surfing regions on the planet. With the Galápagos boasting over 18 major islands that sit in the direct path of both large North and South swells that frequent the region I firmly believe that the surf potential here is truly limitless. These stunning islands are littered with numerous reef slabs, point breaks and beach breaks and with many still waiting to be discovered and surfed. A true surf explorers dream. While visiting the island of Santa Cruz I was fortunate enough to be invited on a boat trip with a dozen of Ecuador's best surfers to document a wave that had only just been discovered and first surfed less than six months earlier by local surf guide Nicolas Andrade and his friends. It was a truly surreal experience weaving through large ocean swells along the rugged coastline of Santa Cruz island for over 45 minutes before arriving at our destination, a rocky pointbreak virtually in the middle of nowhere. Many of the best waves in the Galápagos are accessible only by boat and this wave was no exception. On arrival we were greeted by a perfect peeling left hand point break and despite the slightly ruffled wind conditions the crew of Ecuador rippers proceeded to tear the sh%t out of this quality wave for the next three hours. While the wave was on the more playful side this day Nicolas assured me that the spot regularly delivers up more than it's fair share of ledgey barrels once the swell is a tad bit bigger. 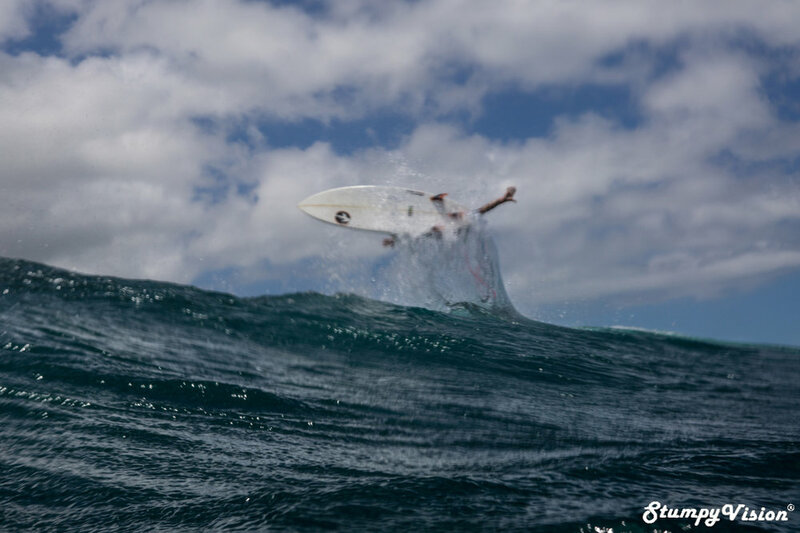 The surf crew consisted of some of Ecuador's best surfers who were on hand to compete in the first National Titles event to be held in the Galápagos region. I was without a doubt among good company which includied the likes of Ecuadorian National Champ Jonathan "El Gato" Zambrano and local Galapian rippers Michael Moreno Ballesteros and Juan Pablo Gerrero just to name a few. They say a picture speaks a thousand words so less chit-chat as it is time for you to browse the images captured to gain an essence of what went down this day. If you are interested in visiting the Galápagos to surf please to check my extensive guide to surfing the region Survival of the Fittest. Nicolas Andrade take a break from behind the lens to snavel a few gems of his won. Picture by Briandy. If you are on Santa Cruz island and wish to access the best waves do not hesitate to contact local surf guide and complete legend Nicolas Andrade (thepointsurf.gps@gmail.com) who always has his finger on the pulse. Andrés Durán sets his line on the peak. Andrés Durán sets his line on the peak. Santa Cruz local Juan Pablo Gerrero getting up close and personal. Jose Francisco Coello poised to strike. Flair, Juan Pablo Gerrero surf with true flair. Andrés Durán on a tasty bowl. American Jay Chaney is not regretting his parent's decision to relocate to Ecuador and can you balme him? El Gato boosting for the clouds. How about that backdrop? Michael Moreno Ballesteros turning his back on nature. Irons Burgos popping one of the top. Skills that were honed in the right hand pointbreaks of Playas, Ecuador. Textbook Gato power surfing. Irons Burgos coming off the bottom. Andrés snapping one off the top moments before running me over, yeah cheers mate! A trademark hack from Se ñor: Ballesteros. Adrian Zambrano throwing chunks to please the crowd. Jay Chaney and one hell of a backdrop. He isn't the Ecuadorian National Champ for nothing you know.